A World Bank report released earlier this year featured a jarring statistic: 200 million people moved to East Asia’s cities between 2000 and 2010. That figure is greater than the populations of all but five of the world’s countries. Commentators argue that the urbanization of Asia is inevitable, with one calling recent growth “just the beginning.” Considered alongside figures about urban migration, the fact that only 1 percent of Asia’s land is urbanized (a popular statistic) appears to validate predictions about the increasing densification of cities. However, growth in the capacity of cities to accommodate industrial growth seems to be flattening. With a rising middle class and booming demand for automobiles, Asian cities can expect no relief from congestion, and this may be a deterrent for businesses. Rural areas are increasingly prepared to absorb this potential shift in demand. In examining Asia’s economic growth through urbanization patterns, it is helpful to consider historic data spanning several decades. Figure 1 compares 54 years of urbanization in Southeast Asia’s five largest economies against India and China, both arguably the 21st century’s most dynamic growth stories and frequent subjects of urbanization research and commentary. Urban population share has been rising consistently in most countries of this study. 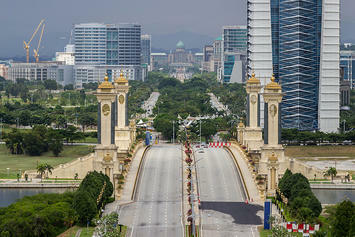 Malaysia has long seen a population majority living in cities, and China and Indonesia both crossed the 50% threshold in 2011. 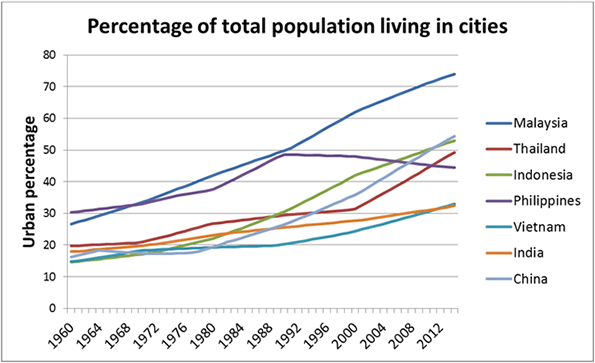 Thailand has also rapidly urbanized since 2000, and will likely pass 50% this year. 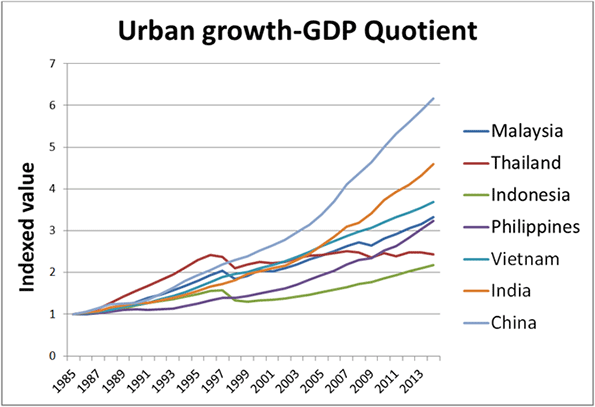 By contrast, Vietnam, India, and the Philippines have been slower to urbanize, with the latter declining since 1990. Part of this variation reflects differences in definitions and measurements of urbanization across countries and time, but the underlying pattern remains clear: the past several decades have seen an urban migration of historic scale. That urbanization correlates with economic growth is a point rarely overlooked. Indeed, the two have supported one another since the emergence of capital- and labor-intensive manufacturing during the industrial revolution. Borne of historic growth patterns, this logic has been used to support predictions of continued industrial urbanization and policies that promote it. However, remote penetration of connective infrastructure – including both transportation and communications – is replacing old growth models with a new rural industrialization. The following data support this claim. The urban growth-GDP quotient (Figure 2) represents urban population growth divided by GDP, and is effectively a measure of how much economic activity countries are extracting from their cities. It is not an absolute measure such as GMP (gross metropolitan product). Rather, it is a measure of how changes in GDP track changes in urbanization, providing a broader look at the relative role of cities in national economies. A time horizon of nearly three decades (1985 – 2014) is chosen to capture the high growth period after market reforms in China (1979) and Vietnam (1985). The indexing approach is necessary to normalize the scale of variables for more meaningful graphical visualization, essentially “controlling” for vast differences in numeric values (e.g. the GDPs of China vs. the Philippines). It also creates a common reference point to compare longitudinal performance across countries. In this metric, China outperforms comparator countries with a particularly rapid increase in the quotient since 2005; it has evidently been successful deriving GDP value from urban areas. By contrast, Indonesia has seen comparatively less urban-based GDP contribution, and Thailand’s contribution has remained roughly the same since outpacing all countries between 1985 and the Asian financial crisis. One factor underlying these differences is the type of industries contributing to GDP growth, and in particular their location patterns (rural vs. urban). 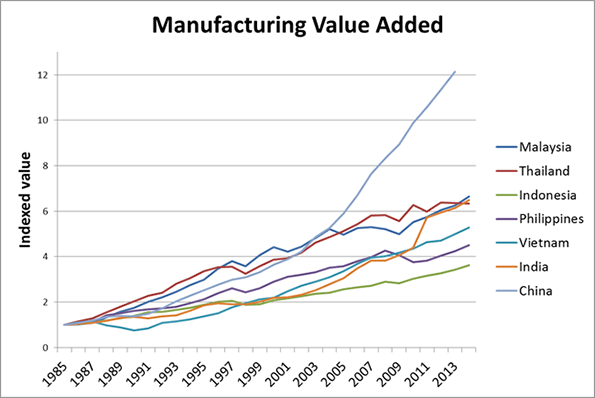 An examination of manufacturing value added (MVA) is necessary to sharpen this analysis, as manufacturing is historically an urban-based activity. Cities provide labor, infrastructure, business services, and global connectivity; their importance to manufacturing is undisputed. The raw MVA numbers (Figure 3) indicate that since 2005, China has far outperformed other countries in the study, most of which showed consistent but not transformative growth. Among the latter, India boasts the lone spike in MVA, and that only recently. To complete the analysis, Figure 4 compares historic patterns of manufacturing growth against growth in urbanization. The indexed quotient replaces GDP (Figure 2) with MVA and can be regarded as a measure of the extent to which countries leverage urbanization to support manufacturing growth. China’s statistical dominance in previous measures vastly diminishes here. 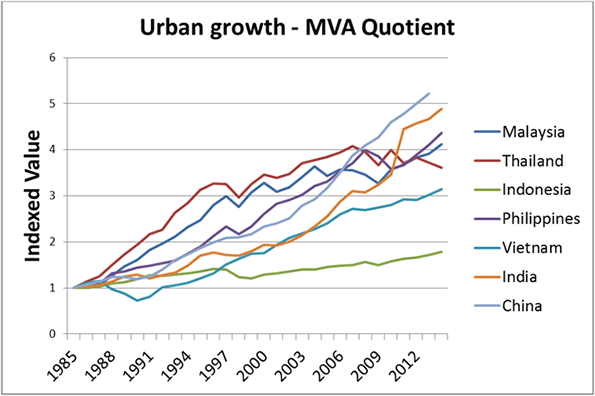 Further, growth in the ability of many remaining countries to derive MVA from cities slows after initially rapid growth. The notable exception is India, and this is the critical point in this analysis. India’s competitive advantage is rooted in the country’s tech sector and other higher-value added activities. From call centers to technology R&D, India has developed a defensible regional position in knowledge-based industries, which are increasingly dependent on the by-products of urbanization: an educated workforce, global talent networks, and lifestyle amenities that appeal to higher-income residents. China maintains its position at the top due in part to its particular urban-based industrialization strategy (special economic zones and decentralization reforms empowering cities). However, China’s conversion of rural agricultural land into industrial facilities is an emerging phenomenon, and the line between urban and rural is fading. For example, in many provinces (e.g. Hebei) factory parcels stand alone, surrounded by farms. In Southeast Asia, as in parts of China, industrialization is not a fundamentally urban phenomenon. From the industrial estates of Thailand’s Eastern Seaboard to the suburban clusters of Vietnam and Indonesia, companies are now finding most everything they need outside of city centers. The advantages are numerous: cheaper land, lower labor costs, less congestion, and in some cases lucrative business incentives. These suburban and rural industrial clusters are even focusing on quality of life for families, looking beyond hard infrastructure to provide housing, education, and recreation facilities. Such amenities appeal to workers of all skill types, from manufacturing to research and development. As such, rural industrialization need not be only smokestacks and assembly lines; an educated workforce can be recruited if rural living standards match those of cities. This broadens the array and sophistication of industries capable of supporting a new kind of growth. Hyper-urbanization visits significant inefficiencies on businesses, potentially making rural regions more attractive for operating. In many of Asia’s major cities, snarled traffic grinds life to a near halt and transit infrastructure has provided only modest relief. Aside from Singapore (a frequent statistical exception), Bangkok and Kuala Lumpur are leaders within Southeast Asia in developing urban rail. However, neither system offers the geographic coverage needed to loosen gridlock. Ho Chi Minh City is currently building its first metro line, but construction is delayed and completion appears to be years away. If hyper-urbanization is re-interpreted as a policy challenge rather than a sign of progress, the decentralization of industrial development can be one solution. Asia’s economic fate is not inextricably linked with the size of its cities, and fresh visions of decentralized growth are already proving their value. The potential is vast; for example, Indian Prime Minister Narendra Modi’s “digital push” and recent commitments to rural broadband represent a development path for the country’s remote regions. Technology, expertise, new funding sources, and emerging economic opportunities are ready to support the rise of rural industrialization across Asia. Kris Hartley is a Visiting Lecturer in Economics at Vietnam National University – Ho Chi Minh City, and a PhD Candidate at the Lee Kuan Yew School of Public Policy, National University of Singapore. Global Cities in the 21st Century: a Chicago Model?